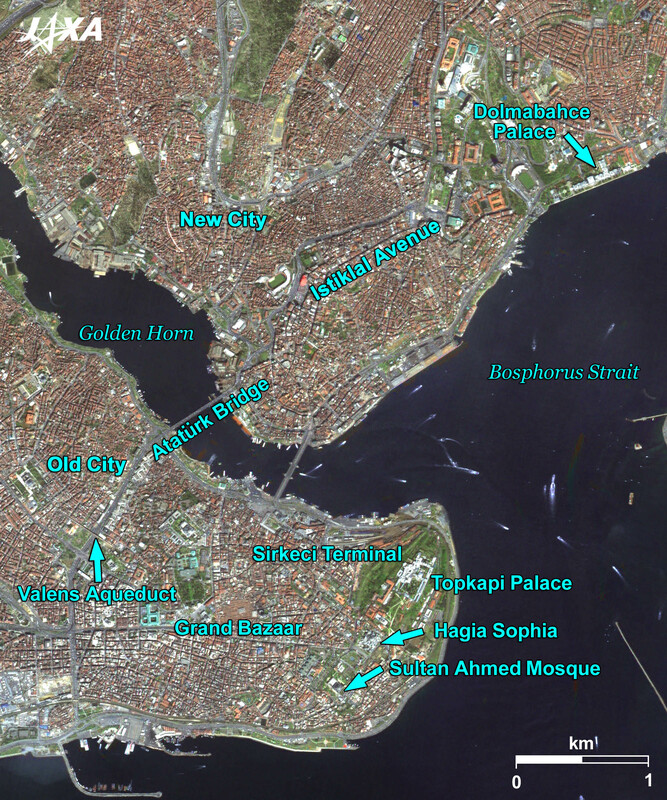 Figure 1 depicts Istanbul and its vicinity as observed by ALOS (“Daichi”) in May 2010. Istanbul, the largest city of the Republic of Turkey, is located on the Bosphorus Strait, which separates the Anatolian Plateau of Asia (the eastern side of the image) and the Balkan Peninsula of Europe. The reddish-grey area in the figure extending over the two continents across the strait is the urban area of Istanbul. Atatürk International Airport is located about 15 km southwest of the city center. It is the largest airport in Turkey and was named in honor of Mustafa Kemal Atatürk, the founder and first president of the Republic of Turkey. The Bosphorus is a 30-km-long (700-m-3,600-m-wide) strait, connecting the Black Sea and the Sea of Marmara. The water supplied to the Black Sea from the surrounding rivers flows through the Bosphorus Strait and empties into the Mediterranean Sea. The light blue sea water flowing from the Black Sea to the Sea of Marmara is visible in the figure. 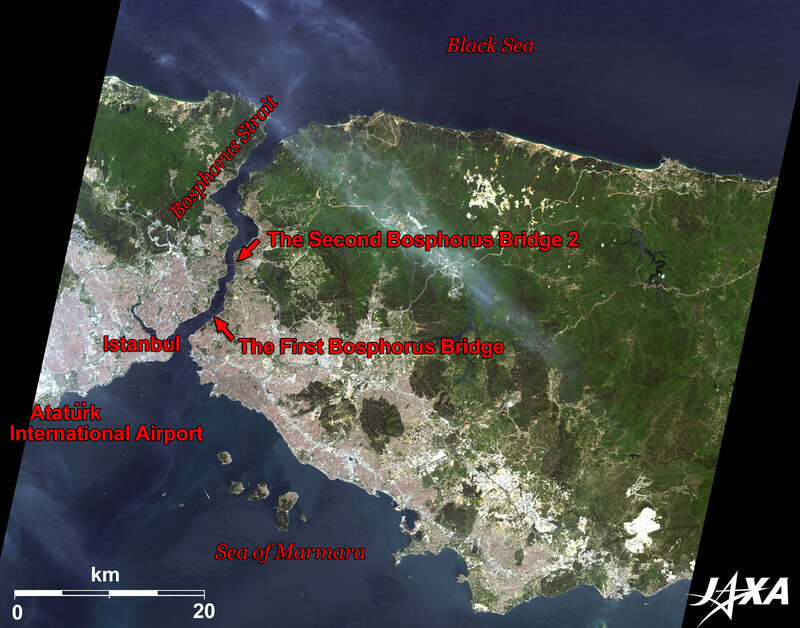 There are two big bridges spanning over the strait, which are also visible in Figure 1. The First Bosphorus Bridge (also known as Boğaziçi Bridge) is a cable suspension bridge with a distance of 1,074 m between the towers* (main span) and was completed in 1973. The Second Bosphorus Bridge (also known as the Fatih Sultan Mehmet Bridge) is a cable suspension bridge with a main span of 1,090 m and was completed in 1988. In comparison, the suspension bridge with the longest span in the world (1,991m) is Akashi Channel Bridge of Japan. A yen-loan fund and Japanese technologies were invested in the construction of the Second Bosphorus Bridge. After the big earthquake in western Turkey in 1999, anti-seismic reinforcement was added to the two bridges, also using a yen-loan fund. * Towers supporting the main cable of the bridge. The European side of Istanbul encompasses the natural harbor known as the Golden Horn. Here, the southern part is known as the old city and the northern part is the new city. The old city, once surrounded by city walls, covers roughly the same area as Constantinople (the older name of Istanbul,), which served and prospered as the capital city of the Byzantine Empire (Eastern Roman Empire) for about 1,000 years. Many historical buildings are located in this area. The lower part of Figure 2 is the old city. The green area on the eastern edge of the old city is Topkapi Palace (Turkish: Topkapı). The usual residence of the rulers of the Ottoman Empire and the center of politics and culture of that period, Topkapi Palace was built on a small hill and blessed with a panoramic view of the Bosphorus Strait. The Hagia Sophia (Ayasofya) is located just below Topkapi Palace. It is a building symbolic of Istanbul. It originally belonged to the Eastern Orthodox Church (Greek Orthodox Christianity), later became an Islamic mosque, and is now a museum. Located south of the church is the Sultan Ahmed Mosque (Sultanahmet Camii**) with its big dome and six minarets. It is a Muslim mosque representing Turkey. The reddish-brown portion at the image center is a market called the Grand Bazaar, a typical sight in the Middle East, where a number of small stores gather in. The Valens Aqueduct (Bozdoğan Kemeri, meaning "Aqueduct of the Grey Falcon") is visible at the lower left of the image. This aqueduct is supported by two-story arches and is 20 m high and 1 km long. Beneath the aqueduct, many cars driving along the road to the Atatürk Bridge are visible. Sirkeci Terminal of the railroad on the European side is located at the mouth of the Golden Horn. This was also the terminal station of the former Orient Express. The old city was registered on the World Heritage List of the United Nations Educational, Scientific and Cultural Organization (UNESCO) as “The historic areas of Istanbul” in 1985. **An Islamic mosque is called “Camii” in Turkish. The new city, which stretches across the upper part of the Figure, forms a business center in which exclusive hotels and shopping areas are located. Contrary to appearances, its history is quite old; merchants of Genoa established the city’s autonomy in the Byzantine period. The grey street in the center of the image extending from the lower left to the upper right (the narrower one) is Istiklal Avenue (İstiklal). This is the busiest street of downtown Istanbul and is always crowded with people—especially on holidays. The green area in the upper right of the image is Dolmabahce Palace (Dolmabahçe). In the early seventeenth century, a cove of the Bosphorus Strait was reclaimed and landscaped as a garden. A gorgeous European-Baroque-style palace was built here in the middle of the nineteenth century and was used as a residential palace of sultans of the late Ottoman Empire. 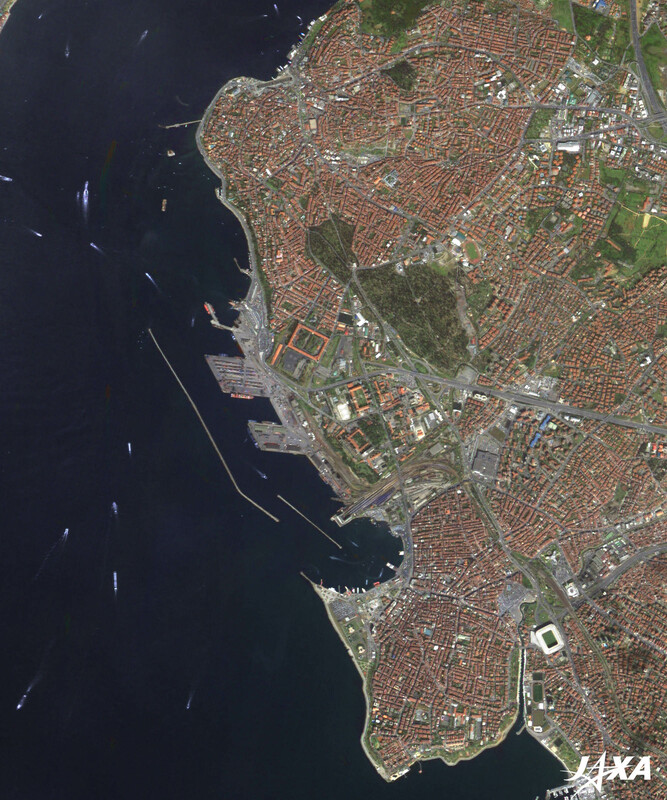 The Asian side of Istanbul, visible as reddish-brown in the figure, is a new residential area. Nevertheless, Uskudar (Üsküdar) and Kadikoy (Kadıköy) have long histories, where old townscapes with traditional houses still remain. Since the cities were not shielded by ramparts, they were invaded and destroyed many times. Haydarpasa Terminal, where the railroad on the Asian side begins, is visible just below the center of the image. The station was built by a German architect in 1906. The railroads of the two continents are now connected by ferry. *** The war between the Russian Empire and the Ottoman Empire, which broke out in 1853 and escalated to the war between the Russian Empire on one side and an alliance of France, the United Kingdom, the Kingdom of Sardinia (which would be absorbed into Italy in 1861), and the Ottoman Empire on the other. A Japanese enterprise is now undertaking the construction of the Bosphorus Strait undersea crossing railroad tunnel (the Marmaray Project). It was conceived in the time of the Ottoman Empire, 150 years ago, and many civil engineers of the world have planned its construction. Yet, none could overcome the problems due to the rapid current (maximum 5 knots per hour) and bad ground conditions (close to the Anatolian Fault). However, the Japan Bank for International Cooperation (JBIC) and the European Investment Bank (EIB) provided major financing for the project, and the government of Turkey ordered a Japanese company to proceed with construction. The strait tunnel was completed in October 2008 and connected to the eastern continent in March 2010. The geometrical pattern that looks like a bar code near the wharf of Uskudar at the upper left of Figure 3 is the station at Uskudar under construction. The straight structure jutting out into the strait is the facility used to bury tunnel blocks made on the ground at the bottom of the sea. Completion of the project is estimated in October 2013. The Orient Limited Express train from Paris may one day stop in Istanbul and Asia. On September 16, 1890, the Ottoman frigate Ertuğrul encountered a typhoon while returning from a goodwill voyage from Japan and sank off the coast of Kushimoto, Wakayama Prefecture. The accident took 587 lives, but 69 sailors and officers were saved and carefully nursed by the local people. Later, they were safely returned home by Japanese ships. This accident and rescue operation created a strong friendship between Japan and Turkey. Commemorating 120 years since the accident, both countries are planning various events to further strengthen the friendship. PRISM is an optical sensor for observing ground surfaces with visible and near-infrared signals in the 520- to 770-nanometer (one-billionth of a meter) band. The acquired image is monochrome. PRISM has three independent optical systems (telescopes) to acquire images for nadir, forward, and backward views at the same time. Only the nadir image was used in this article. The above AVNIR-2 composite image was then transformed into hue, saturation, and intensity, and the intensity was replaced by the PRISM image. The hue, saturation, and intensity data were then reversed into a color image. As a result, a virtual 2.5-m ground resolution color image was obtained. This kind of high-resolution color image, composed by combining the higher resolution monochrome image and the lower resolution color image, is called a pan-sharpened image.